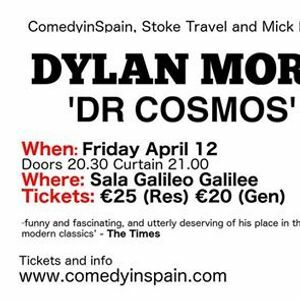 Dylan Moran - Dr Cosmos Live in Madrid! the Casino in Poble Nou. We expect this one to go very close to selling out so why take chances with one of comedy's true greats!!! 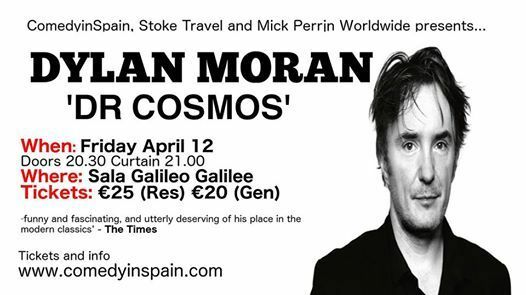 Dylan Moran returns with a brand new tour, Dr. Cosmos, which will take in 42 venues around the UK before 32 international dates in 2019. Moran will once again offer his unique take on love, politics, misery and the everyday absurdities of life, all served with poetical panache from one of the finest comedians of his generation. Dylan Moran is a comedian, actor and writer who, in 1996 at the Edinburgh Fringe, became the youngest ever winner of the Perrier Award. He went on to co-write and star in Black Books which won two BAFTAs. Other notable screen roles include Notting Hill, Calvary, Shaun of the Dead and Run Fatboy Run. Moran has toured the world many times, including versions of his show as far afield as Kazakhstan, Ukraine and across the US.